Graham Coxon is to release his third solo album 'Crow Sit in Blood Tree' on 6th August. Speaking to the NME, Graham described the new album as having a "therapy vibe" and said it had been recorded as catharsis to a "general malaise" he had been feeling. "It's quite a precious record to me," he said. "I always seem to write songs at some sort of crisis point...that's why I recorded it very fast. I finished it last Friday (June 1)." However, Graham refused to be drawn on what exactly had created his personal crisis this time. "There's always something, isn't there?" he mused. "I dunno, it was just sort of, general Camden psychosis I think. It was written in a general malaise - pretty much in the deeper depths of the dark little sea of me." Graham is to also make five short films to go with a selection of songs from the record. Empty Word, I'm Going Away, All Has Gone, Burn It Down, Too Uptight, Big Bird, Tired, Hurt Prone, Bonfires, Thank God For The Rain, You Never Will Be, A Place for Grief. Channel 4 are to make virtual band Gorillaz into a Television series. Creator Jamie C Hewlitt, of Tank Girl fame, will be made busy creating a number of short episodes for the channel to be shown on a weekly basis. Channel 4 will be showing a recording of Blur's Singles Night Live at Wembley Arena back in December last year on Wednesday 1st November at 12:30am. Blur have teamed up with iobox.com to let fans download the Music is My Radar ringtone on their mobile phones. Dave Rowntree programmed the ringtone himself, and has also provided a special 'blur: the best of' phone icon featuring all four members also for download. plus both Graham Coxon and Alex James have also contributed to 'The Weird and Wonderful World of Blur', which will see both members picking b-sides, rarities, collaborations, solo tracks, remixes, and previously unheard demo's. Graham Coxon has remixed an IDLEWILD track for the B-side of their new single 'ROSEABILITY', released on October 16 through Food. The final single to be taken from the band's third album, '100 Broken Windows', will be released on 7" and 2 CDs, featuring a mix of album track 'Rusty' by Coxon, which Idlewild frontman Roddy Woomble says is "pretty great, very heavy, I'm a fan". There will also be two brand new unreleased songs, 'Thousand' and 'I've Only Just Begun', recorded in Glasgow last month. Idlewild guitarist Rod Jones toured with Graham Coxon recently, and played the Carling Weekend Festivals in Reading and Leeds with both bands. Coxon returned the compliment, joining the band on stage at Reading and playing saxophone on set-closer 'Captain'. Damon Albarn visited Mali in West Africa to meet and work with traditional musicians and raise awareness of what life is like in developing countries as part of the education project, On the Line. Using music as a way to cross cultural and language borders, Damon met with local musicians to learn about their lives, music and culture. In a marriage of musical styles between the UK and Africa, Damon met with celebrated artists such as kora player Toumani Diabat� and praise singer Kasse Mady to study their style of music, often joining in on jamming sessions. Mali is classified as one of the poorest countries in the world, but has an amazingly rich musical heritage. The beauty and melody of Malian music is unrivalled and its history is intricately woven into the culture, dating back to the 13th century. Praise singers or jelis still sing the praises of their family or profession and their country today, as they did thousands of years ago often backed by traditional instruments like the kora (lute), the ngoni (guitar) and the balafon (xylophone) to create a unique sound. Damon Albarn says, "It was such a positive experience visiting Mali discovering the strength of musical tradition and meeting the people there. I think that with all the negative images about Africa on the news, it is easy to forget that people in countries like Mali are just like you and me. When you do realise that you have a lot more in common than you thought and experience the richness of the culture there ? it makes the inequalities between us seem very unjust." The On the Line project, founded by Oxfam, Channel 4 and WWF-UK, explores the diversity of life in the countries that lie on the Greenwich Meridian line. Its aim is to change the way we in the UK see, think and act towards the developing world, by drawing on the similarities of life in the different countries. The trip to Mali was organised with support from the British Council. See www.ontheline.org.uk for more information on the project and take a look at http://www.ontheline.org.uk/entertain/celebs/damon0.htm where there are exclusive pictures of Damon's trip, plus a sound clip recorded at his jamming session with Toumani Diabate. Damon's much talked about collaboration with dance producer Dan The Automator will be released on October 23 . Dan who's previously produced Primal Scream, is going under the name Deltron 3030 - also the album title. Damon has contributed vocals to a track called "Time Keeps on Slipping". Meanwhile, speculation is growing about Damon's involvement in a non-Blur project under the name Gorillaz, An EP, possibly titled "Tomorrow Comes Today" is due to appear next month on Parlophone, and a video had been made for the EP featuring "cartoon monkeys in cityscapes"
The new single, will be released on 16th October as follows. The B-Sides: Headist & 7 Days, were recorded in May 1992 & She's so High in June 1990. All three were recorded live for Radio One's Evening Session. On Friday 15th September, Alex and Dave will be involved in a creating SPARKS event in London. It is at 19.30 at the Royal Geographical Society in South Kensington. Professor Colin Pillinger of the Beagle 2 Mars lander team will explore these questions with novelist Stephen Baxter, Alex James, Dave Rowntree, and other well-known personalities from the worlds of science, music, art, film and the media to find out what Mars means to them. Tickets are �12, concs �10 Ticket Hotline 0870 842 2220 or book online. More info at www.creatingsparks.co.uk. 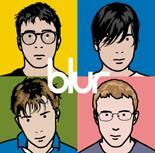 'blur: the best of' - is to be released at the end of October. The album contains 18 tracks, including one brand new song. 'Music Is My Radar' which will be released as a single on October 16. The album will be released on CD, cassette double vinyl, and minidisc formats. A limited edition of the CD will feature a bonus live CD, recorded at London's Wembley Arena in December 1999 during Blur's 10th Anniversary Singles Night Tour. The album cover art for the best of, out on October 30th, was painted by Julian Opie.